Whenever we arrive at our destination Wyatt says All Done car. Unless we have arrived somewhere he doesn’t want to go and in that case he screams. 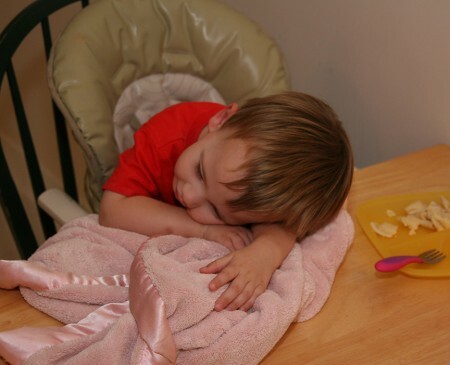 Most evenings he screams when we turn on to our street – he never wants to come home after childcare. In fact on the drive home he points at other roads and yells “go this way” – always the opposite direction of home. Wyatt loves socks and shoes. He has definite opinions about what shoes he wants to wear and if he had his way he would wear socks and sandals. When we put his socks on he says Bye-Bye Piggies and then Bye-Bye Socks when we put his shoes on. He hates when we take them off before bath/bed. Our standard routine to keep him from screaming is to ask if he has hot piggies because his toes are usually so warm. Most nights he is happy to check on his hot piggies and the other nights he protests. Shoes equal going somewhere in Wyatt’s head so he always wants to be prepared. He is my tantrum child. His face turns red, he makes fists and waves them around yelling “Don’t Want It” and then usually throws himself down on the floor and screams. Eventually he realizes that I have walked away and sometimes he will find me and lay back down on the floor. At some point I guess he will figure out that this method of protest never works and quit. I can ignore the screaming, however recently he is escalating to hitting. This morning the boys were fighting over the same puzzle (a regular morning occurrence) and Wy got mad and hit Ru. I told him no hitting so he reached out and tried to pinch Ru instead. Usually he saves the kicking for me. He goes from completely happy to crazy, out-of-control mad in seconds. His vocabulary has exploded in the past month – he is using phrases like ready, set, go. And sadly he is calling me Mommy more often than Mama these days The clearest words he says are his favorite things – cookie, cake, treat, Elmo. 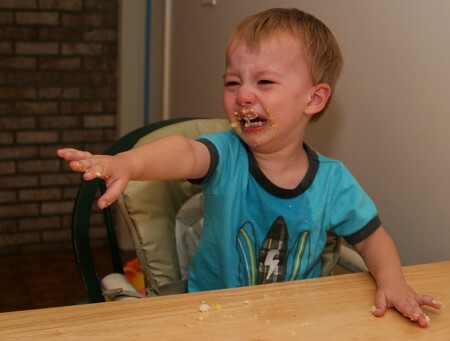 This is what happens when Wyatt finishes a cupcake and wants more – oh the sad, yelling “I want more cake”. 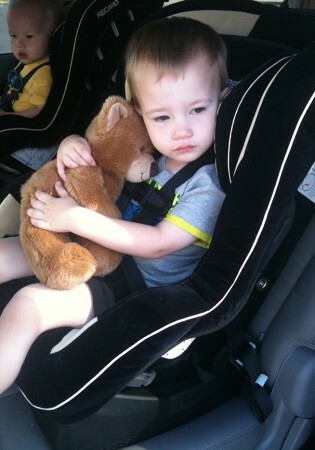 Wyatt continues his love of all things snugglie – stuffed animals, blankets (his and others) and other random items. 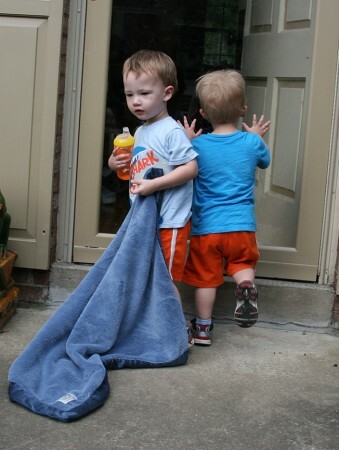 It’s rare that he doesn’t drag something to the car in the morning and then it is a sad good-bye when we reach childcare and he has to leave his “friend” in the car. 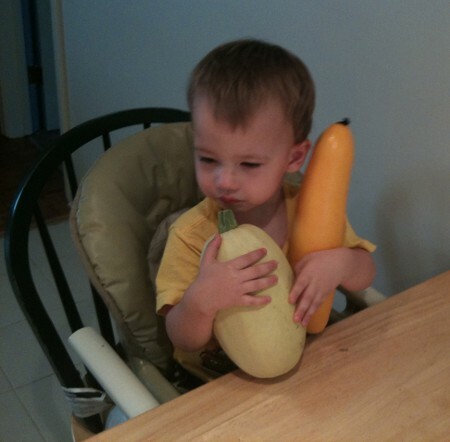 We think the love of the squash may be related to Veggie Tales. 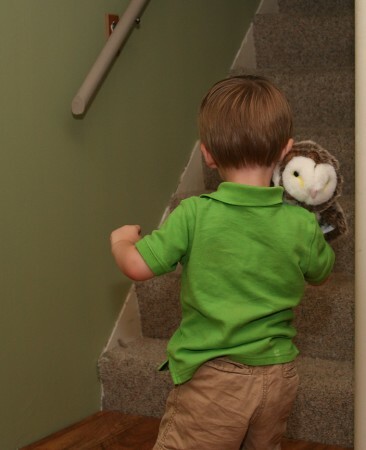 He found the owl at a friend’s house this weekend and carried it around the whole time we were there until we distracted him with cake so we could get the owl away before we left.